The Flash returns from an extended hiatus to introduce another bus meta and teach Ralph another lesson about being a hero. A sizeable chunk of my criticisms of this season are attributed to Ralph. I find the character annoying which is definitely a personal reaction to the way he’s written but I also find the treatment of him frustratingly repetitive. Pretty much every episode has him learn a nearly identical lesson about overriding a character flaw in order to become more heroic. The idea of someone struggling to adjust to super powers and having to overcome their own self serving attitude in order to become a better person as well as a hero is a strong and relatable idea as it is something that many would have to overcome if they were in Ralph’s position. Not everyone can be as intrinsically “good” as Barry Allen so there’s nothing wrong with this idea but the execution is consistently way off base with really forced humour and repetitive storytelling. To this episode’s credit it does try to subvert the norm a little bit though it’s not enough to make much difference. 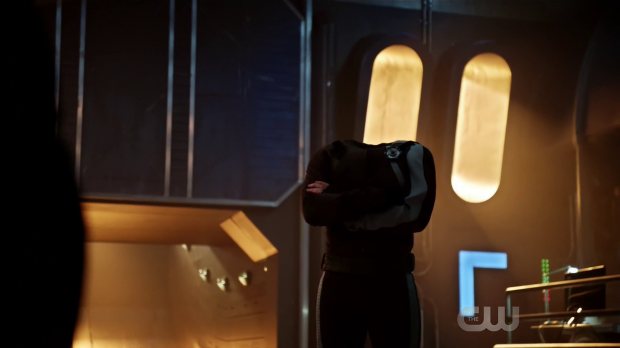 Ralph’s problem this week is that he doesn’t take anything seriously which irritates Barry because he’s immensely stressed out at the team’s inability to gain any ground against DeVoe. He sees Ralph treating everything as if it’s a big joke as a liability and gets to the point where he benches him in the field because it’s far too distracting otherwise. The thing is, Barry isn’t wrong here. Ralph’s attitude makes him reckless and the mistakes he makes are beyond stupid. Barry needs him to take the situation seriously so that they have a better chance of stopping DeVoe but Ralph seems incapable of doing so. The slight subversion comes from Barry learning that Ralph’s way of doing things isn’t without merit. Barry takes things too seriously and is getting himself too wound up over a problem that he really can’t solve. He may not completely take Ralph’s point by the end of the episode but he definitely sees that he has been unfairly taking out his frustrations on him. Ralph’s attitude may not fit the situation but his tendency to wing it in certain situations could prove to be an asset as DeVoe is able to calculate their behaviour so being unpredictable might be part of the key to stopping him. At least that’s part of the overriding lesson at play here. It’s fine to say that Barry in theory learns to lighten up a bit and focus less on planning though I’m not sure this will carry through to the next episode. Ralph also theoretically learns that he has to take things more seriously because of the stakes at play when he’s out in the field. Unfortunately he’s learned this lesson many times in different ways so it’s hard to be invested in him as a character because he never really learns anything. Last season I had a theory that there is some unknown metahuman who erases the memories of Team Flash every week so that they forget the lessons they learned and have to learn them again. This certainly applies to Ralph and to an extent the rest of the team. Speaking of erasing memories; Marlize learns that her body switching husband has been keeping her in line using mind altering tears combined with Dominic’s mental abilities to erase her memory. We did see that she was starting to become uncomfortable with what her husband was becoming and it was clear at that point that DeVoe was manipulating his wife which sets Marlize up as a potentially tragic figure. This episode fully leans into that idea when she spends some time running tests on herself after a broken cup raises her suspicions due to the foreign liquid in there. She learns the truth and records a video warning herself of what her husband is doing. Unfortunately this isn’t the first time she has learned the truth and it doesn’t look like it will be the last as DeVoe is well aware of what Marlize has been up to and resets her every time she learns the truth. In essence she’s caught in a Groundhog Day scenario where she is unable to progress because she can’t retain the knowledge that will allow her to do so. Her husband is keeping her docile and using her to further his own plans with no thought about what this will do to her or their relationship. 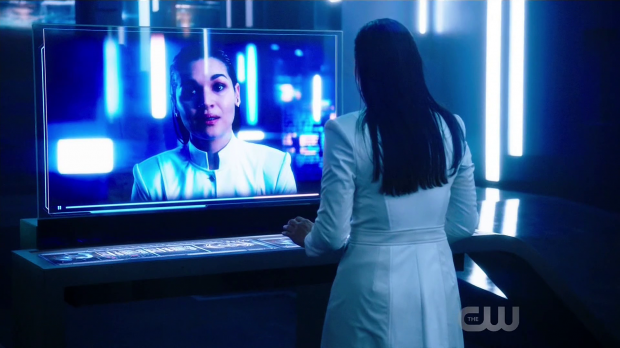 I really liked the way this was done and was genuinely surprised by the reveal even though I should really have seen it coming considering the clear mention of the plans for an upgrade to DeVoe’s chair being partially complete. The clue was in there as the engineering side of things has always been Marlize’s field and it turns out that she has been working on them for a while but forgetting about it after she discovers the truth and is reset. It is all but confirmed that Marlize will end up betraying her husband at some point in the near future. The episode doesn’t really go into this but what he’s doing to her is nothing short of a violation that robs her of choice and very much makes her a victim. In today’s world this is a very topical idea to play with and it is being handled really well so far even if the exploration of it is so far limited. It makes sense not to go into what this really does to Marlize as she doesn’t remember what has been done to her for long enough to go through it and she doesn’t have anyone to discuss it with. I dare say Caitlin or Iris will help her process it before too long which does sound like profiling though it’s in keeping for this show to have the female characters comfort other female characters. Not always but that is my prediction. Another bus meta makes themselves known in the form of Janet Petty aka Null (Bethany Brown). It basically plays out as another “villain of the week” type story and is fairly unremarkable even by those standards. Bethany Brown is impressively over the top in the role and her powers are creatively handled but there’s nothing to her character in terms of motivation. She steals stuff because she likes to steal which is fair enough as some people will just be like that though her thieving is unnecessarily elaborate suggesting that she enjoys an unconventional challenge. The episode doesn’t deliver anything on her character to either confirm or deny that but it does seem to be the case. One thing that does stand out is her ability to outsmart Barry by having contingency plans. 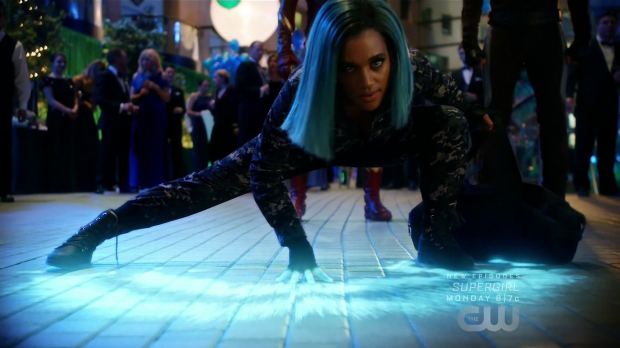 Setting up a falling car to distract Barry so that she can escape is a clever idea and would potentially be a decent counter for Barry’s speed through diverting his attention. Sadly all this did was remind me of “Enter Flashtime“. 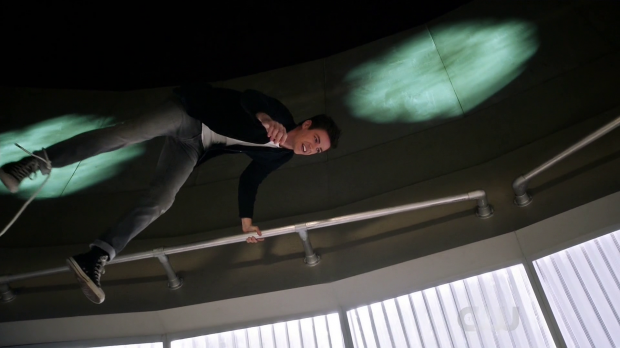 I said at the time that this episode broke the show as Barry is definitively established as fast enough to make time stand still from his perspective as well as run around quickly as he’s doing that. This means that diverting his attention wouldn’t work because he’s fast enough to deal with the distraction and return to what he was originally doing. Null thinking it would work is fair enough as an idea but Barry should have been fast enough to save the man in the falling car and lock Null up in the pipeline before she had any idea what was going on. We also see Barry be blindsided by her attacks on two separate occasions though I don’t actually have an issue with that as being frustrated with Ralph would be enough to ensure that he wasn’t entirely focused on the situation. 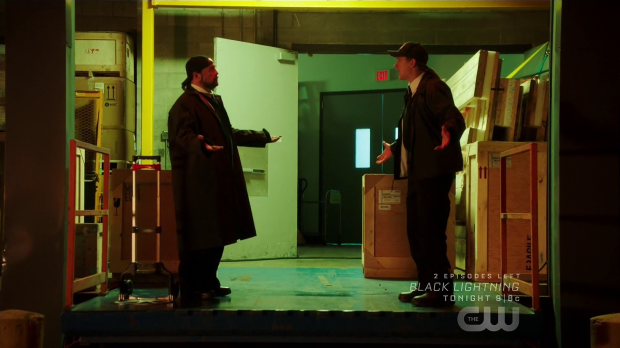 Null’s appearance does bring an amusing surprise by introducing security guards who may or may not be Jay and Silent Bob (Jason Mewes and Kevin Smith respectively) to the Arrowverse. If they aren’t the same characters then they are certainly a strong nod to them based on their depiction. With all the forced attempts at humour in this episode it was refreshing to see something that felt a little more natural. They were certainly well used as part of the story and made for a fun addition. Tied into the Null plot is Harry’s growing frustration at his inability to outsmart the Thinker. His Thinking Cap does give him an advantage though it’s inconsistent which causes him to react angrily to his inability to solve what he sees as simple problems. Harry definitely isn’t himself in this episode though I think Tom Cavanagh overplays it as I get the impression that it’s supposed to be a subtle change in Harry based on the fact that the rest of the team barely react to it other than encouraging him to relax. The end of the episode suggests that Harry is becoming corrupted by his invention when he wakes up Gideon to deliver what appears to be some sort of convention in a very eerie Eobard Thawne sort of voice. I’m interested to see where this goes as letting Tom Cavanagh dust off his villainous chops is definitely something I’d like to see. Another subplot exists when Danny Trejo’s Breacher comes to ask Cisco for help after his powers fail him. This plays out somewhat similarly to Breacher’s last appearance with Cisco being terrified of him and trying to mine comedy from that. It feels really forced as Trejo is playing Breacher as far more over the top than last time where he was more sinister and threatening. It’s a shame that this had to be ruined by forced comedy as I really like the idea of someone with powers having to deal with the fact that their age means that they are unable to continue using their abilities like they used to. It’s an end point we rarely see in the comic book medium so exploring this in a more serious way might have been interesting. Instead this is all played for laughs though it does set up the possibility of Cisco taking Breacher’s place and I predict that once DeVoe is dealt with he will decide to take him up on this offer to be with Gypsy before returning at the beginning of season 5. Despite finding this plot uninspiring it was cool to see a brief appearance by the DC comics villain Crucifer (Mikael Verge) even if his appearance adds very little other than providing a nod to a character we may never see otherwise. If Cisco does go off on a reality hopping adventure it might be worthwhile spending some time letting him be away from Team Flash to see other Earths and introduce outlandish concepts that the show might not be able to do otherwise. An uneven episode that once again has Ralph learn a lesson he should already know. There is an attempt to subvert this by having Barry realise that he shouldn’t take things so seriously all of the time but Ralph’s recklessness is still a problem and he ultimately comes to the same realisation he always does only to presumably forget it minutes later. Marlize learning about her husband drugging her and erasing her memory is really well done along with the associated implication that she is being violated. It seems clear where this is going and it makes sense for it to play out this way. The villain is entertaining enough with cool powers but should have been more easily stopped considering the recent confirmation of Barry’s immense speed. Adding in Jay and Silent Bob -or characters like them- was a really nice touch and one of the few examples of humour that didn’t feel forced. The appearance of Breacher could have been a good idea as the idea of someone growing too old to use their powers is an interesting one but the idea suffers from forced humour though the prospect of Cisco replacing him is intriguing. Harry’s implied descent into morally questionable territory is a strong prospect that works well enough though Tom Cavanagh overplays the lead up to that.